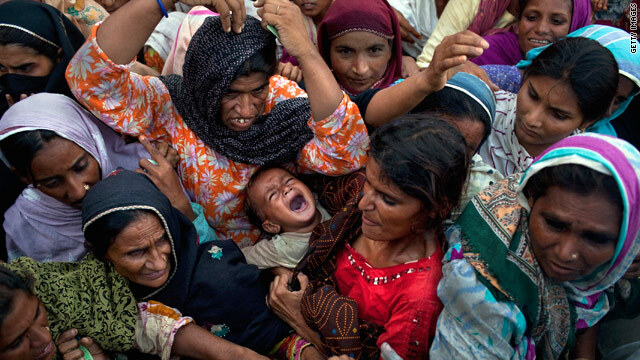 A child cries as a crowd of villagers fight for bags of flour on the outskirts of Muzaffargarh in Punjab, Pakistan, August 20, 2010.
WHO: "The depth of suffering is incalculable"
(CNN) -- The massive flooding that has covered about one-fifth of Pakistan has claimed the lives of more than 1,500 people, authorities said Saturday. The death toll from the three-week flooding has reached 1,514, the nation's disaster management agency said. Officials fear the number could continue to rise because of diseases from unsanitary conditions. More than 200 health facilities have been damaged or destroyed, according to the World Health Organization, greatly reducing the available health care for millions of survivors in filthy conditions. At least 4 million people are homeless. Dr. Guido Sabatinelli of the World Health Organization said reports of diarrhea have increased 30 percent. "The depth of suffering is incalculable as risks escalate of diarrhea, acute respiratory infection, malaria and other communicable diseases," Sabatinelli said. "It is crucial that all humanitarian health providers, local and national, coordinate their relief efforts closely to save lives, reduce suffering and deliver the most effective response." United Nations officials have appealed for $460 million over the next three months to help the roughly 20 million people in need of shelter, food and emergency care. The U.N. has received about $263 million and an additional $54 million in pledges -- or about 70 percent of its goal, said Maurizio Giuliano, spokesman for the Office for the Coordination of Humanitarian Affairs. WHO said waterborne, airborne and vector-borne diseases, including acute watery diarrhea, measles, malaria and acute respiratory infections, are threats due to overcrowding, lack of hygiene and breakage in waterlines. CNN's Samson Desta and Mila Sanina contributed to this report. If you or loved ones are being affected by the massive flooding, share your story, images or video with CNN. Heavily-pregnant Rehmad Abbasi is lucky to be alive after being pulled from the water. "It sucked me under," she tells CNN, almost hyperventilating. The United Nations has established more than a thousand health clinics across Pakistan in the wake of widespread flooding, a U.N. official says. "The most vulnerable and have been disproportionately affected," an aid worker tells CNN. Long-term recovery efforts in flood-ravaged Pakistan could take "many, many months, if not years"